Are you having a tough time deciding on a good starter sailplane? Good choices for a beginner's sailplane typically have been planes whose wings span about 2 meters (about 78 inches) or a bit shorter. These planes also only use rudder and elevator for control surfaces and require only 2 channels of control in the radio transmitter - one for the rudder and the other for the elevator. Over the many years of radio controlled planes, three very popular gliders for beginners were the Goldberg Gentle Lady, Dynaflite Wanderer, or Great Planes Spirit. Each of these planes weighed in at about 1-1/2 and 2-1/2 pounds depending on the size of radio installed, covering and finishing options. That's OK. Lighter is always better in a sailplane, but when building your first plane don't kill yourself trying to get that last ounce of weight out of the plane. That extra ounce or two just isn't going to matter that much when you're learning to fly. Just follow the instructions as best as you can and try to have fun while doing it. More recently, there's a new type of plane that has become common for beginners and expert flyers alike. These planes are made from EPP (Expanded Polypropylene) or EPO (Expanded PolyOlefin) foams and these planes are nearly indestructible. EPP and EPO is a bit heavier than the traditional 'built-up' construction method, but since these planes are SO much more durable, they make for great first airplanes. Many existing glider manufacturers have stopped doing business, which is unfortunate. There are a few new comers which can take the place of those kids, such as: WhipIt or UMX Radian. Both of those planes are pre-built and have a motor/propeller so you can fly them in an open field. But you can also fly them on a slope just like other sailplanes without power just fine. Also those two planes only require that you purchase a DSM2- or DSMX-compatible transmitter. After you've built or purchased one of these foamie planes as your first, only then consider building something with balsa and other materials. You can read below about other planes that have been commonly built (by me and lots of other modelers) over the years by visiting other pages on this site. Here's some information on my extra special Dynaflite Wanderer. Years ago, the Wanderer used to cost about $25 via mail order. It's similar to the Spirit in flyability and construction, but different in other ways. (I'd take my trusty Wanderer any day!) The Wanderer was a proven design that was originally kitted by Mark's Models in 1976 or so (I can't remember when it was first released). I know this because I built more than 30 of them around that time. I used to custom build and sell them to others to help finance my hobby. I found them easy to build and easy to fly. The Wanderer can also be quite manueverable if you build in some additional modifications that I built-in to most of the ones I built. I'm mentioning the modifications here, even though the Wanderer isn't available anymore to give you an idea of some simple ideas that can have a dramatic affect on a plane's flyability - be careful when building! [If you're interested in the modifications I used to put in to the Wanderer, click Wanderer Modifications.] The Wanderer has to be my overall favorite built-up polyhedral design R/C sailplane. On a light slope, it was really a great plane for Sunday fun flying (and I still have mine, even though it's more than 35 years old now). There are a few planes out there that are made of foam, such as the EPP Ranger from Canterbury pictured here, so you can be a bit rougher with those planes. It's harder to make any modifications, but those planes are newer, so you're probably in for a better deal anyway! Once you've built your sailplane (you did follow the kit instructions, didn't you? ), get someone to help you check the controls and balance the plane as per the instructions. Correct balance means that the center of gravity (C/G) is correctly set so the plane's lifting center is near the center of lift generated by the wing. If your sailplane is NOT balanced properly, it simply won't fly right or worse you may have no control over the plane after it leaves your launching hand. Only after you are sure the plane is balanced properly and that the control surfaces (rudder and elevator) move the correct direction when you move the 'sticks' on the transmitter, you're ready to try it out. When I first started I thought that I could do everything myself. I built the entire plane, covered it, installed the radio, and generally thought I could do it all (testosterone poisoning, no doubt!). My father (yeah, this was a LONG time ago) drove me to the local slope where I'd heard they flew r/c sailplanes. I was all ready to toss it out into the air when, luckily for me, a 'nice flyer guy' came over to see my new plane and offered to help. If he hadn't, my first flight would probably have been disaster. I had hooked up the elevator backwards and the servo that controlled the rudder came loose as soon as the slightest pressure was applied to the linkage. This would have probably resulted in the plane going out of control immediately after launch. Instead, with his help he had my plane fixed up in only 10 minutes, right at the slope. He also volunteered to teach me how to fly and I really needed that too (even though I thought I didn't need help). And, yes! My plane flew! If you're really shy and would rather do things yourself, I'd still get someone to look over the setup in your plane and verify that things are, at least, hooked up to the rudder and elevator correctly. After that you can practice in a local school yard by hand launching your sailplane to get the basic feel. It's risky, but private. Still need more information about beginning in sailplanes? Do you have some of your own stories you'd like to tell? I'll post them in the articles section if you care to share. Horizon Hobby "Night Radian" - 28" span, motor glider with night lights! 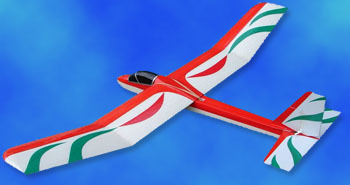 Horizon Hobby "UMX Radian" - 28" span, motor glider with night lights!